Gabriel Heimler is an artist of international renown, was born in Paris. He completed his studies at the Ecole des Beaux-Arts de Paris in 1988. He started exhibiting at the Grand Palais while studying there. He was selected by Magritte’s wife, Mirabelle d’Or, for the Salon de Figuration Critique. From this, the doors to the Drouot Auction House were opened to him and Heimler sold his first paintings. Heimler has spent the last twenty years living and painting in Berlin. 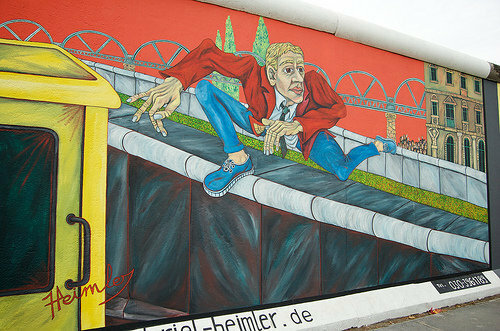 His fame started in 1989 with his ‘Wall Jumper‘ mural painted on the Berlin Wall. The mural is part of the East Side Gallery, the second most visited historical monument in Berlin with 700.000 visitors per year. Heimler sold through Sotheby's in New York and at galleries in Berlin, Paris, Frankfurt and Brussels amongst many others. He also showed his creativity while working as an art curator throughout Europe. Heimler’s work is inspired by a cocktail of German expressionism, cubist perspectives, pop-art and cartoon strips and shows a love for detail. His paintings are flamboyant, colorful, packed with interesting concrete narrative and conceptual issues based on literary, biblical, historical and art history topics. Heimler looks to underline a deep human individuality and to show emotions and feelings. According to Manfred Giesler, a German art critic, “everything Heimler paints is real and unreal – even surreal – at the same time and shown with much love for the people and objects he depicts. Heimler is one of the very few painters who definitely have their own and unique style, known as ‘the Heimler‘s world’. This world appears to be a real one”. Heimler’s artworks can be seen in private and public collections in France, Belgium, Germany, Great Britain, Italy, New Zealand, Australia and the USA. In his 20 years career Heimler sold about 2000 paintings. Since 2010 Heimler has transported his world to New Zealand. He works with his partner Anna Proc. They painted murals ’The Mover’ and ’The Copy of Rousseau’ at the Museum Hotel opposite Te Papa National Museum as well as ’The Open Sea Path’ at Upper Cuba Street and ’The Arc de Triomphe‘ in Wellington. They are represented in galleries of Wellington, Nelson, Napier, Berlin and Copenhagen. WE CONNECT UNIQUE LOCATIONS WITH THEIR HISTORY. WE SHOW HUMAN POTENTIAL. IN 1989 GABRIEL PAINED 'THE WALL JUMPER' ON THE BERLIN WALL IN THE MOMENT OF ITS FALL. TODAY IT IS ONE OF THE MOST VISITED HISTORICAL MONUMENS IN BERLIN. IT IS TO THE PEACE MONUMENT AND SYMBOLISES LIBERTY. IN 2010 GABRIEL PAINTED WITH HIS PARTNER ANNA PROC 'THE MOVER' ON THE MUSEUM ART HOTEL IN WELLINGTON. IT REPRESENTS A MOVE OF THE HOTEL ON WHEELS IN 1993 IN ORDER TO MAKE WAY FOR THE NATIONAL MUSEUM TE PAPA THAT HAS BEEN LOCATED ACROSS THE SREET. IT SYMBOLISES HUMAN ACCOMPLISHMENT AND WAS VOTED THE BEST MURAL OF THE CAPITAL. IN 2011 WE PAINED 'THE ARC DE TRIOMPHE' IN THE ENTRANCE OF THR OLD DOMINION POST BUILDING. IT WAS CREATED IN THE OCCASION OF THE RUGBY WORLD CUP AND SYMBOLISES CULTURAL CONNECTION BETWEEN FRANCE AND NEW ZEALAND. REPRESENTS THE GERMAN HERITAGE OF THE CONFLICT BETWEEN WEST GERMANY AND EAST GERMANY. THE PAINTING REPRESENTS THE GERMAN HERITAGE OF THE CONFLICT BETWEEN WEST GERMANY AND EAST GERMANY. Art Express took place in Berlin, Budapest, Essen (European Culture Capital 2010) and at Balaton (Balatonfüzfö) in Hungary. In the context of Art Express international artists from Berlin, Budapest, Paris and Essen painted fiction imagery based on their life journey between their birth place and chosen home and art creation place. At the same time the artists were asked to maginfy their view about the town they settled down and to become ambassadors of their town. Every artist representing his own personal style creates three paintings. 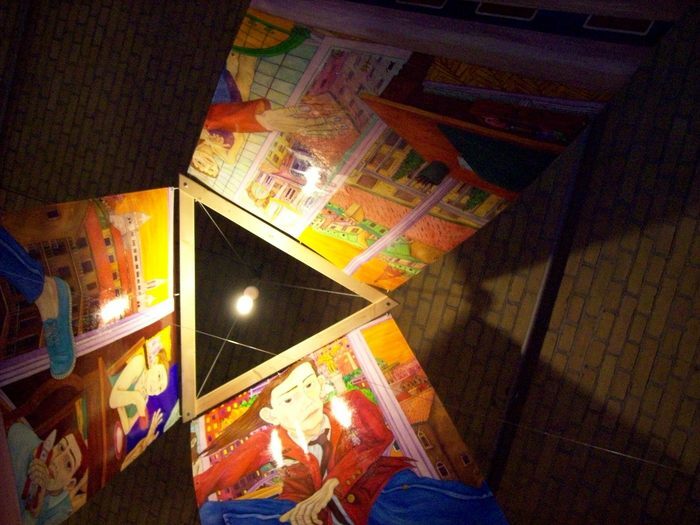 They are fixed on a triangle base that hangs from the ceiling in a form of a tent. Each internal space created by three paintings has to be regarded separately making reference to the Leibnitz philosophy of human individual as unique and connected with another by waves . We look for other artists that would love to participate in Art Express and to invite the exhibition to their towns. What makes a difference between two humans? We do not try to show the diversity but to show the unity of the universal beauty of the body. Who am I? Who are you? There is only a blue line that separates us.